What Are the Biggest Rivalries in Baseball? What a tough question. 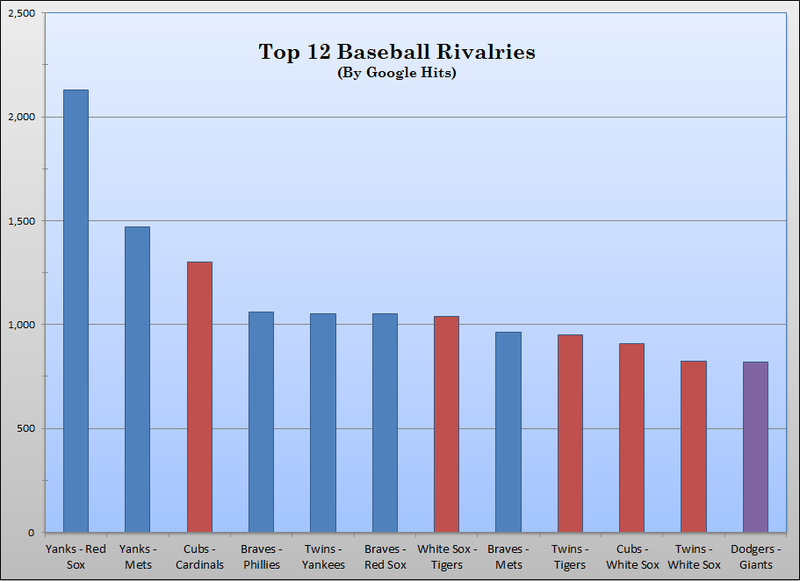 What are the top rivalries in baseball? I’m sure Yankees fans will claim it’s Yanks-Boston, but if you went out on the West Coast, I bet you’d hear plenty of fans saying Giants-Dodgers deserves more consideration. How exactly do you declare one rivalry “bigger” than another? How do you measure fan excitement, and compare one fanbase against another? Is it possible? Probably not, but regardless, I’m going to take a stab at it anyway. My methodology is very simple: I’m ranking rivalries based on the amount of Google hits returned for the search “(Team name) (Team name) rivalry”. I freely admit that I’ve stolen this idea from other people, notably Nate Silver who in the past has used Google hits as a proxy for voter awareness of presidential candidates. Is this method perfect? No, of course not. It enters in certain biases, as the media undoubtedly shapes which rivalries are written about over others, but I think the results are nonetheless fascinating. Take them with a grain of salt if you will, but overall, I’d say these rankings come close to modeling reality. 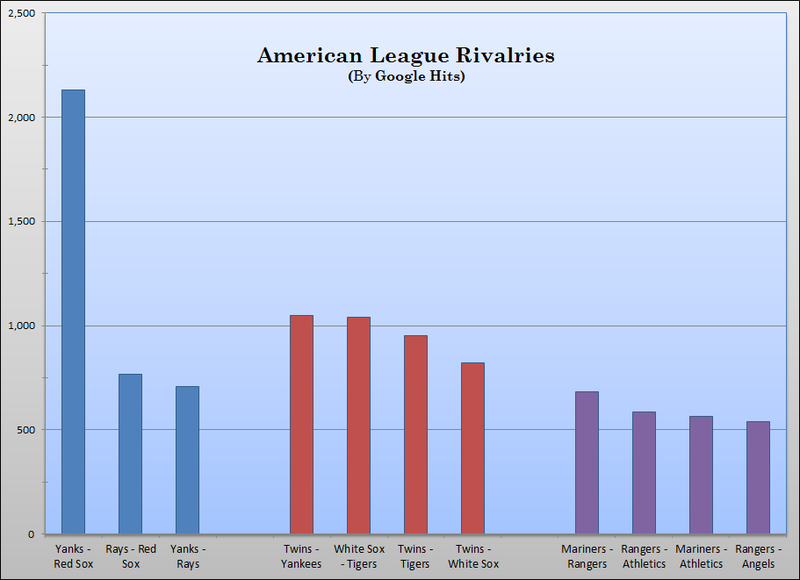 This first chart ranks the top rivalries in the American League, separated out by division. The AL East is on the left, AL Central in the….center, and AL West on the right. And now for the National League. Be aware, the Yankees-Red Sox rivalry skewed the scale on the first graph, so the National League chart only goes up to 1,500 hits (not 2,500, like the AL graph). Wow, East Coast bias much? The AL and NL West both look like they have no big rivalries, with the Giants-Dodgers rivalry being the largest of them. Is this because there are no big rivalries out on the West Coast, or is it simply that the media doesn’t talk about them? West Coast fans, feel free to chime in on this. From all reports, the Giants-Dodgers rivalry is pretty huge — heck, I don’t think any of us need to be reminded of the horrible incident that happened at one of those games earlier this year — but even then, it’s rated as only the fourth-largest rivalry in the National League. Personally, I can’t think of many large rivalries on the West Coast, but that may just be me. Also, the White Sox and Tigers have a rivalry? I honestly had no idea — is this true? Cubs-Cardinals is a very well-known rivalry, but I’m still impressed that it managed to beat out the NL East rivalries for the top spot in the National League. It must help that both those teams have such large, passionate fanbases. For ease of comparison, here’s a summary table of the above charts, listing out the top-12 rivalries in baseball (color-coded by division). 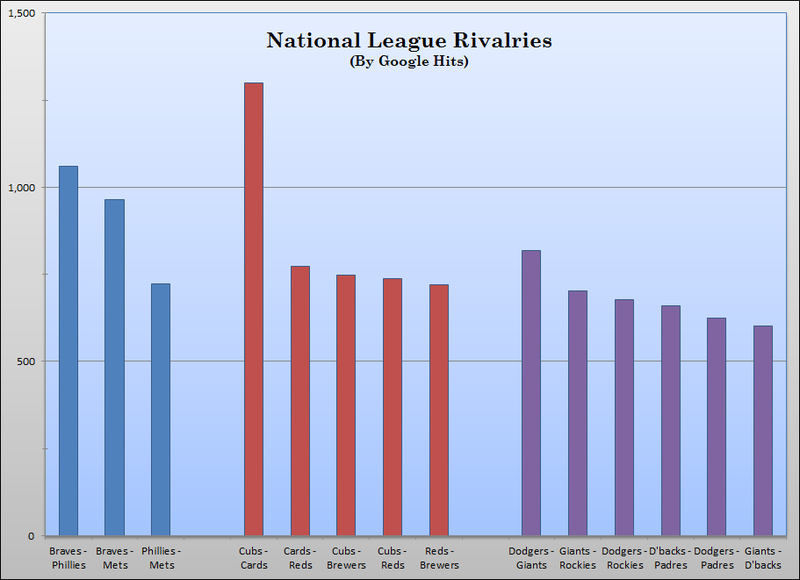 I’ve also included the top Interleague play rivalries. Looking at all this information, it’s pretty easy to determine the important factors necessary for a good rivalry. Be on the East Coast. Be located close in proximity to a fellow team — if you’re both in the same city, all the better. And have some history behind the matchup; the older the clubs, the more established the rivalry. Also, as a final note, I think it’s more difficult to establish a rivalry in divisions where multiple teams are bouncing in and out of the playoff race on a yearly basis. Take the NL West — how do you establish a rivalry when three different teams have won the division over the last four seasons? Who do you hate? But when your division gets dominated year after year by the same one or two teams, it’s sooo much easier to have strong feelings about your fellow clubs. Is this an imperfect list? Most certainly, and everyone is going have different opinions based on where you live. But at the same time, the rankings for the top-four rivalries sure feel right to me. We hoped you liked reading What Are the Biggest Rivalries in Baseball? by Steve Slowinski! Steve is the editor-in-chief of DRaysBay and the keeper of the FanGraphs Library. You can follow him on Twitter at @steveslow. This is why the world loves Mariners fans.